For years fans of the Star Wars: Battlefront series have been bemoaning the loss of the rumored canceled third installment of the game. Mod team turned full-fledged developer Frontwire Studios is creating their own version of the game, and they say Valve is prepared to distribute it for free on Steam. Galaxy in Turmoil began as a CryEngine mod from a group of dedicated fans. Now it’s a full game built using Unreal Engine 3, and that group of fans has formed a virtual development studio some 50 strong, working on a mobile game and an unannounced AAA title alongside Galaxy in Turmoil. During a livestream in late April (as seen at Gamespot) the team said the finished product would be released for free, noting a Steam release would be unlikely due to it being an unlicensed game. An announcement posted earlier today on the Frontwire blog says the studio has entered into an agreement with Valve to distribute the free game via Steam. The announcement post included an image of a Steam page for Galaxy in Turmoil, though no such page is live on Steam as of this posting. Since no release window has been given for the project there’s a fair chance the listing is currently private. We’ve reached out to Valve to verify the agreement, and will let you know should they get back to us. The obvious question here is how long will it take Disney to kill this project? A free downloadable fan game is one thing, but Galaxy in Turmoil getting a Steam release just upped its profile substantially. Frontwire president Tony “Fergie” Romanelli looks to be taking the reported Steam agreement as a sign that the project is in less danger of being shut down. I admire the tenacity of the developers and their commitment to bringing fans a game they felt was unjustly taken away from them. Still, this is a Star Wars game featuring Star Wars vehicles, characters and settings. 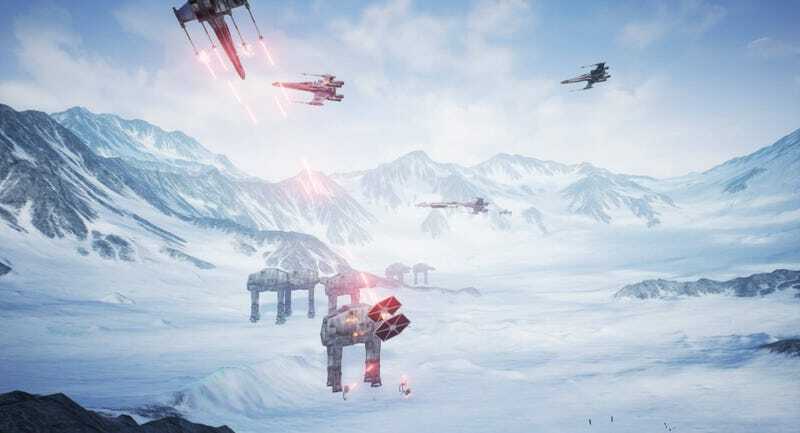 Plus Disney has been pleased with the reception of EA’s official Battlefront game, and Galaxy in Turmoil would be competition for that title on the PC platform. Between EA and Disney, I fear this new hope might not last.